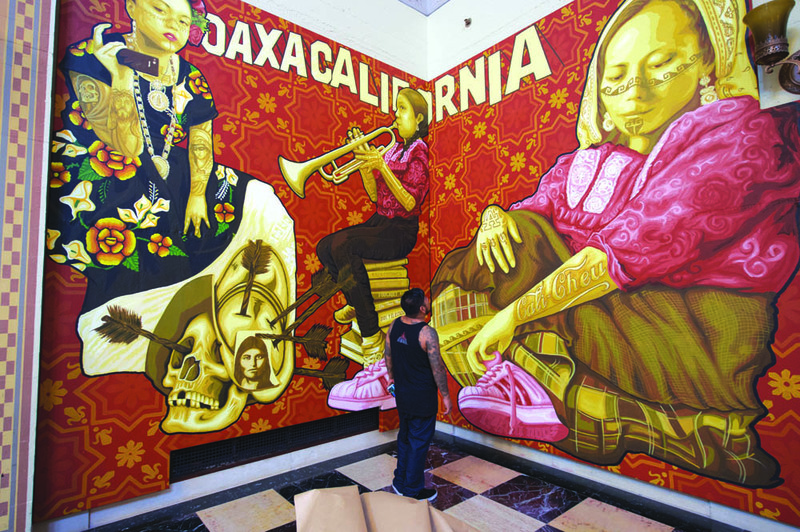 ALOUD, Library Foundation, Los Angeles Central Library, Los Tlaculolokos, Louise Steinman, Maureen Moore, Oaxacalifornia, Visualizing Language: Oaxaca in L.A.
David Canul touches up a mural commissioned by ALOUD at the Central Library for Visualizing Language: Oaxaca in L.A. Photo: Gary Leonard. In the early ’90s, when my brother Tomás followed his heart from the Bay Area and a hard-earned position at the renowned Teatro Campesino to Los Angeles, I followed him. A few winters before, I’d followed him from Austin to San Juan Bautista—where the teatreros, or “theater folk” led by director Luís Valdez had taken him in as one of their own—and gotten my first real glimpse of a California I could belong to. Although fleeting, it was a vision that shimmered, taking shape around the possibility of transforming communities everywhere into multi-hued beacons of art, culture and thought. In Los Angeles, the ALOUD reading series at the Central Library has cultivated a similar spirit through successful literary programming for 25 years. With the abrupt and inexplicable dismissal of ALOUD’s founding director Louise Steinman and associate director Maureen Moore by the Library Foundation, that vision has been shattered. My brother, I’m proud to say, had played water polo at Bassett High School in the San Gabriel Valley where we lived briefly as Texas transplants during the early 1970s. Seven years my senior, he was already—at least to me—a formidable artist. He could draw anything. A year before, newly arrived in Southern California and not yet 14, he’d proudly worn a Brown Beret while walking home from swim practice at a middle school in La Puente. A gift from our cousin Albert, a teacher at East L.A.’s Garfield High, the beret represented both a political and cultural movement that validated Mexican American youth like my brother “Tommy,” a shoe-in for Wally Cleaver to my own uncanny, unrehearsed, seemingly separated at birth turn as Beaver. After years spent searching vainly for ourselves in The Brady Bunch, The Partridge Family, Twilight Zone, Doc Savage and Hardy Boys books, as well as Marvel Comics, that beret made it possible to see ourselves as painters and poets, pianists and playwrights. It fired Tomás’ creative aspirations with a vitality that awes me still. Indirectly, it would also one day lead me to the majestic Central Library in Los Angeles and a chance meeting with Steinman 20 years later. She was working quietly, I sensed even then, to remold this complex metropolis into a place where books, truth, inquiry and imagination might foster tolerance, compassion and creativity for everyone equally. More than simply imagining a city I felt I could truly belong to, she was making it real. Arriving in San Juan Bautista on that earlier holiday season excursion, I found my brother in a 200-year old Spanish mission church rehearsing for a comically irreverent Christmas passion play. Some among the cast and crew divided their time between San Juan Bautista and the Bay Area. Others split their time between San Juan and L.A. The brother I’d grown up emulating threw in with these, making his way to Southern California finally, parking his bags in Chinatown first and then moving to Lincoln Heights. I joined him in L.A. shortly thereafter, eager to be his tag along for a few days and returned for another whirlwind visit in ’92. By then he had taken a job with a children’s theater production company, which is why I found myself inside the most beautiful municipal library I had ever seen. While he set up for a Saturday afternoon production at the library’s Mark Taper auditorium, I explored the building, marveling at its rotunda, and riding the escalators. Imagine a library so large that escalators are required to move patrons about. It was as if I’d stepped through an invisible door and become a character in a short story by Jorge Luís Borges. In the auditorium foyer, I introduced myself to the circumspect yet elegant woman who seemed to be there in an official capacity. We spoke of Chicano poetry and Latin American “Boom” writers. Handing me her card, Steinman asked if I knew any Latino or Chicano cartoonists I could recommend for a panel she was putting together on the art of comics. Either coincidence or kismet, I’d recently been in contact with Lalo Alcaraz, a satirist, editorial cartoonist and creator of the nationally syndicated L.A. Cucaracha comic strip. Alcaraz, now an Oscar-winner for work on the animated film Coco, and I had been introduced by my brother, of course. Though Steinman made no mention of plans for a reading series, something in her pensive and at once inquisitive demeanor communicated both poetry and practicality. Her interest in a balanced and provocative cartoon art panel that would create dialogue across ideologies and cultural idioms was sincere. I forwarded her information to Alcaraz, who accepted her invitation to participate as a panelist. ALOUD was launched shortly thereafter, coinciding with my brother’s move back to Austin—our hometown since 1973—to start his own theater company. Guided by Steinman, ALOUD had been gaining momentum and garnering unprecedented audiences for seven years by January, 2000 when I moved to L.A. Many of the writers I admire had read from their newest works at ALOUD long before my arrival, among them were John Updike, Ursula K. Le Guin, Dagoberto Gilb and Maxine Hong Kinston. The roster of guest writers in the new millennium is a testament to an expansive curatorial vision with room for emerging local poets on one end to Pulitzer-winning authors and internationally acclaimed storytellers on the other. Over a round of drinks downtown after an ALOUD event, a second generation L.A. native suggested sincerely that unless you were born here, you couldn’t call yourself an Angelino until you’d attended at least three ALOUD presentations. Moore’s hiring augured what I can only describe as ALOUD on overdrive. A listing would be pointless. Three events, because of the books at their center and personal reasons, remain unforgettable: a reading by award-winning journalist Jesse Katz in March, 2010 from his memoir The Opposite Field; the sell-out Mother’s Day evening with Isabel Allende in 2010; and the January, 2012 presentation of The Barbarian Nurseries, the best-selling novel by Héctor Tobar. Visualizing Language: Oaxaca in L.A., which ran from September, 2017 through January, 2018, was, in my view, the clearest iteration of the dynamic cultural contributions, visionary programming and critical civic dialogue Steinman and Moore have catalyzed through ALOUD. An interdisciplinary project produced by Moore as part of the “Pacific Standard Time: LA/LA” arts initiative, Visualizing Language converted the Library Rotunda into an art gallery and shed light on hybridized indigenous cultures in Los Angeles. 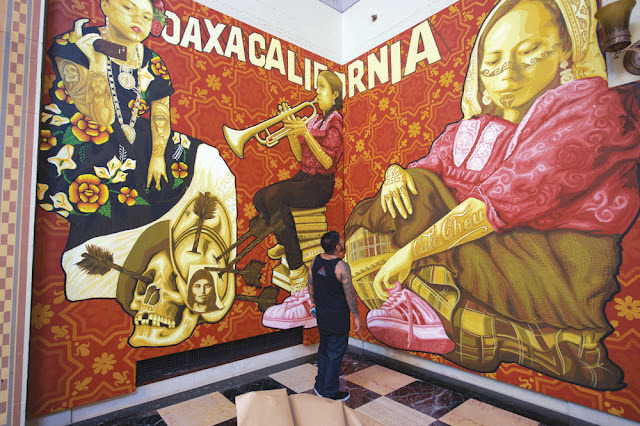 Anchored around a series of commissioned murals by a Zapotec art collective, the project addressed a little known 70-year indigenous Oaxacan diaspora, as integral to the cultural fabric of Los Angeles as the legacy of the Chicano Movement, the Civil Rights struggle or Hollywood. National media coverage and the record number of first-time library visits the project generated were undeniable. Accordingly, the mural exhibition was extended through August, 2018. The Library Foundation has yet to offer valid reasons for terminating the two people behind one of the most breathtaking, culturally profound library experiences ever organized anywhere. Moore and Steinman are the heart and soul of ALOUD, and we owe them more than gratitude. Both deserve reinstatement and pay raises for their service to the city. I owe them, personally, for their commitment to realizing the Los Angeles that beckoned me in the soft glow of a soldering iron my brother used to etch hopeful graffiti onto small pieces of wood once upon a time in a San Gabriel Valley suburb.